Festival Report: Radhastami Celebrations ~ The Toronto Hare Krishna Temple! With summer winding up, it may seem that festivities around the city have quieted down, but that is not the case at the Toronto Hare Krishna Temple. With great pomp and show on Friday, September, 9th devotees at the Toronto Hare Krishna Temple celebrated the birthday of Srimati Radharani who is the female counterpart of Lord Krishna. This day marks an auspicious moment where we celebrate the appearance of Srimati Radharani, who is the mother of this entire universe. All throughout the evening, devotees prayed to Srimati Radharani for her causeless mercy. 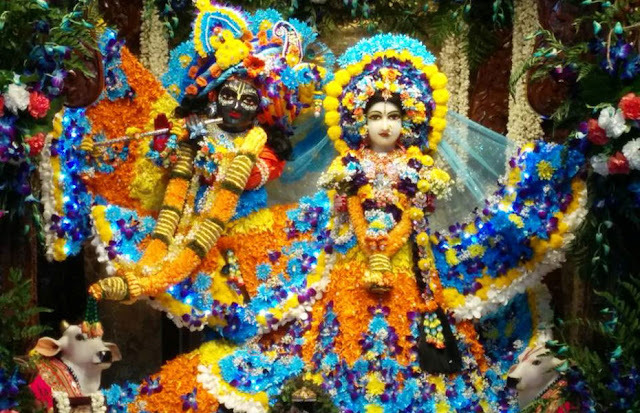 Firstly during the opening kirtan (arati) ceremony, Their Lordships Sri Sri Radha Ksira-Chora Gopinatha, were marvelous in their sky blue outfits marked with many mysterious dark blue specks. Then Ananda Gauranga Dasa gave a discourse on the pastimes of Srimati Radharani. With great skill, he seamlessly wove each story into the next and presented a beautiful string of stories that we could all relish! Then a gift giving ceremony took place for Srimati Radharani wherein the gifts that devotees brought for the Deities were opened. Gifts of all sorts poured in, everything from kitchen utensils, laundry detergent, hair braids, to intricate jewelry had been covered. The excitement reached a crescendo, with the closing arati ceremony. When the doors swung open, in a dimly lit altar, the Deities were glowing with tiny specks of blue light, radiating from their clothing. In that moment, it felt like Srimati Radharani was lighting our lives with the effulgence of a thousand splendid suns! After hearing a roaring kirtan, and seeing a cascade of flowers being offered to the Lord, everyone gathered for a delightful vegetarian feast. Every devotee experienced the mercy of Srimati Radharani who sparked spirituality into all of us!